Bryan Evans, PR practice area leader at Trellist Marketing and Technology writes, "The practice of public relations is not what it used to be, but history can teach us some important lessons." 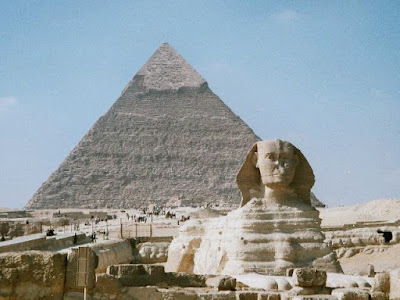 Khafre's Pyramid (4th dynasty) and Great Sphinx of Giza (c. 2500 BC or perhaps earlier). In the past, great care and effort went into crafting messages and pitch development. For example, when Julius Caesar wrote his compelling pitch in 50 B.C., his vivid portrayal of military exploits convinced the people of Rome that he was the best candidate to be head of state. When Cleopatra combined her fluent command of the Egyptian language and mathematics as a communications tactic, she improved relationships and restored economic instability in ancient Egypt. Today, the tides have changed as digital public relations professionals attempt to recreate this dynamic. In 2015, news can be spread farther, faster, and more directly than any other time in history. The digital revolution—even over the past decade alone—has forever altered the practice of public relations. While some have yet to embrace the new rules of digital outreach, others have lost sight of the time-tested art of engagement that has been on display since antiquity. Perhaps the ability to strum the chords of human emotion through words and execution has gotten lost in the tombs of digital technology.